Daniel Kent, 16, of Carmel was recently named one of America’s top ten youth volunteers for 2005. Selected from a field of more than 20,000 applicants nationwide, he received $5,000, an engraved gold medallion and a crystal trophy for his school, Brebeuf Jesuit Preparatory School in Indianapolis. Contributed photo Gen. Colin L. Powell, USA (Ret. 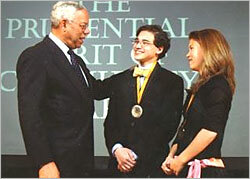 ), U.S. Secretary of State (2001-2004), congratulates Daniel Kent, 16, of Carmel (center) and Alexandra Miller, 14, of Greenwood (right) on being named the top two youth volunteers in Indiana for 2005 by The Prudential Spirit of Community Awards at a ceremony May 1 and the Smithsonian Museum of Natural History in Washington, D.C. He and Alexandra Miller, 14, of Greenwood were recognized at the Smithsonian Museum of Natural History, along with the top two youth volunteers of every other state, the District of Columbia and Puerto Rico. All 104 honorees were presented with $1,000 awards, congratulated by Gen. Colin L. Powell, USA (Ret. ), U.S. Secretary of State (2001-2004) and received engraved silver medallions and an all-expense-paid trip with their parents to Washington, D.C., for the recognition events. Kent is a sophomore at Brebeuf Jesuit Preparatory School in Indianapolis. He created a non-profit corporation that supplies senior citizens with computer equipment and skills. For several years he has taught both seniors and elementary school students how to use computers and the Internet. One day he realized that there were many seniors who lacked the mobility or transportation to come to his classes and thus founded “Senior Connects,” a remedy to the problem.